I can’t take any credit at all for the big idea that I want to share in this short post. In fact, I am shocked that I have lived with the Bible for so many years and had never really seen this as clearly as I was helped to see it (by the teaching pastor, and by the Holy Spirit) this past Sunday. I have read that text hundreds of times. No kidding! I have heard it quoted more times than I can count in almost 30 years of being a follower of Jesus, and until this past Sunday, I had never really thought about what the text is saying. That, by the way, is one of the reasons I love the Bible. No matter how many times you read it, you can always learn something new. That was so true for me with respect to this text! I always heard it as Jesus’ call to love one another. But what about all that “new commandment” language? The call to “love one another” is not a new commandment at all. It’s an old commandment, and it is the second commandment. In fact, in Matthew 22:36-40, Jesus says that the second commandment to “love your neighbor as yourself,” along with the first and great commandment to love God with our entire being is the center of the whole law of Moses. There are basically two ways that we could say “new” in Greek. We could say “neos” which is the word for something new in the sense that it was not there before, but now it is. Or we could say “kainos” which is the word for something even better than what was already there before. It’s the second word, kainos, that Jesus uses in John 13. It is a commandment that is even better than the original commandment about loving others. In the original commandment, love for neighbor was measured by the standard of how well I love myself. As an aside, I am personally convinced that this is a statement suggesting that I actually already love myself quite a lot. And if I can direct that same intensity of love toward others, I will — as this commandment has it — be loving my neighbor as God intends. In this construct of the commandment, my love for myself is the measure of how I am to love others. 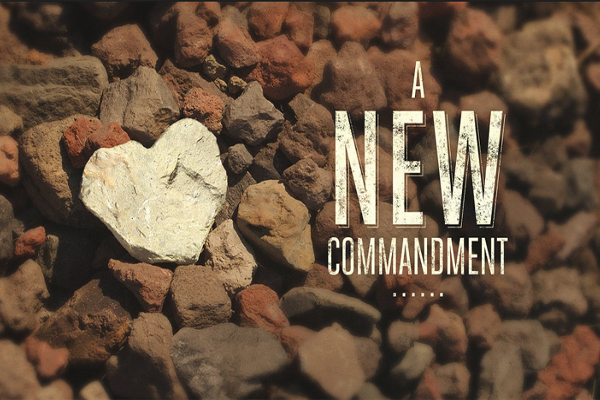 But in Jesus’ “new commandment” the measure of love for others is reoriented to Jesus and his love for his disciples. He says to them, “Love one another just as I have loved you.” Here, John uses the word kathos where the text says “just as.” And Jesus is not saying — “Since I love you, you should love your neighbor.” That’s not what kathos means. Nope. It means “in the same manner, with the same quality, and in the same way that I love you, love one another.” This is not about “paying it forward.” This is about doing love for others in the same manner that Jesus does love for others. This is about self-giving love that does not stop until the self-giving love equals the same quality and quantity of self-giving love shown by Jesus himself. In this equation, my love for myself is no longer the standard of love for others. Instead, Jesus’ love for us is the new measure of love. This is liberating on at least two levels. For the person who really loves him/herself a lot. For the person who claims not to love him/herself much, or at all. In either case, we can rejoice that our relative level of love for self is no longer the measure, the example, the quality, or the degree to which we are to love others. Instead, we are to look to Jesus and let him be the standard by which we evaluate love for others. So — according to Jesus, there is ἐντολὴν καινὴν (“entolain kainain” — a new commandment). There is a commandment that has echoes of the original, but which is much better! It’s better because the standard for love of others is no longer how much, or the manner in which I love myself. The new measure of love for others is Jesus. In short, Jesus does not want me to love my neighbor as myself. He wants me to love others in the same way that he loves me. I have a lot to learn about this. I’ll have to keep following Jesus because I simply can’t do it without him. But I want to learn to do it from him.